It is not only our favourite Yogi Bear that likes a “pic-a-nic”! 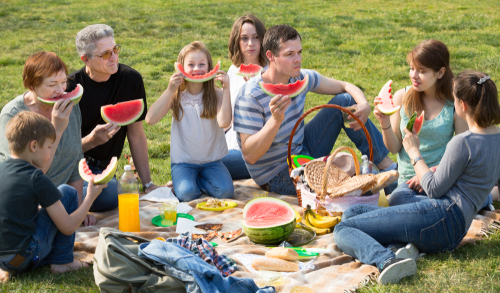 With the fresh air sharpening your appetite and the company of good friends and family creating a happy atmosphere, a picnic can be a simple summer pleasure that everyone loves. Picnics are best enjoyed on a fine, sunny day in a grassy field, by a river or beside the sea, with a clean tablecloth spread on the ground and a hamper full of tempting and delicious food and drink. Crunchy vegetables – carrot sticks, celery, radishes, cucumber, sweet pepper strips and sugar snap peas served with a dip. 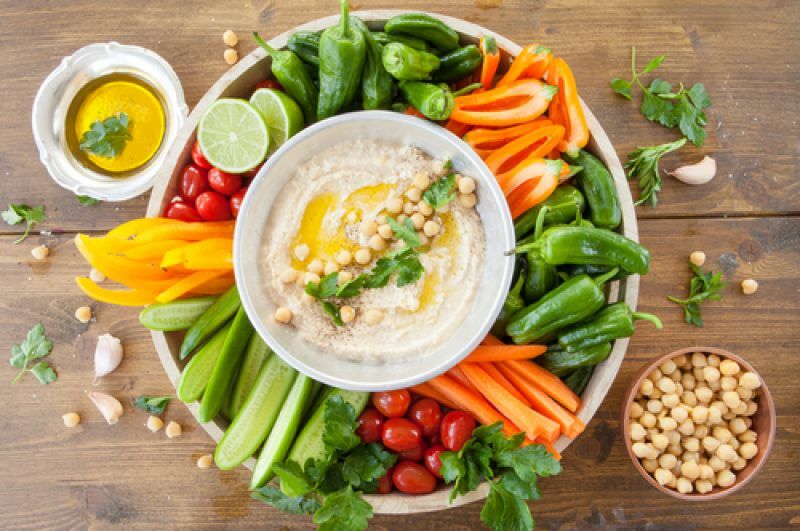 This could be something as simple as cottage or low fat cream cheese or a light home-made hummus, made by blitzing together in a food processor a peeled, stoned avocado, a 240g can of chickpeas (drained), a pinch of chilli flakes and the juice of a lime. A salad of lettuce, watercress, halved cherry tomatoes, chopped spring onions, cooked and cooled fine green beans and new potatoes with some chunks of poached or hot-smoked salmon added. Transport in a lidded bowl and add your favourite salad dressing just before serving. Lighter Coronation Chicken – gently fry 4 sliced spring onions and 2 tbsps korma curry paste for 2 minutes and stir into 100g 0% fat Greek yoghurt. Add 50g chopped dried apricots, 15g toasted almonds and two cold roasted chicken breasts cut into chunks. Serve with salad in a wholemeal roll. 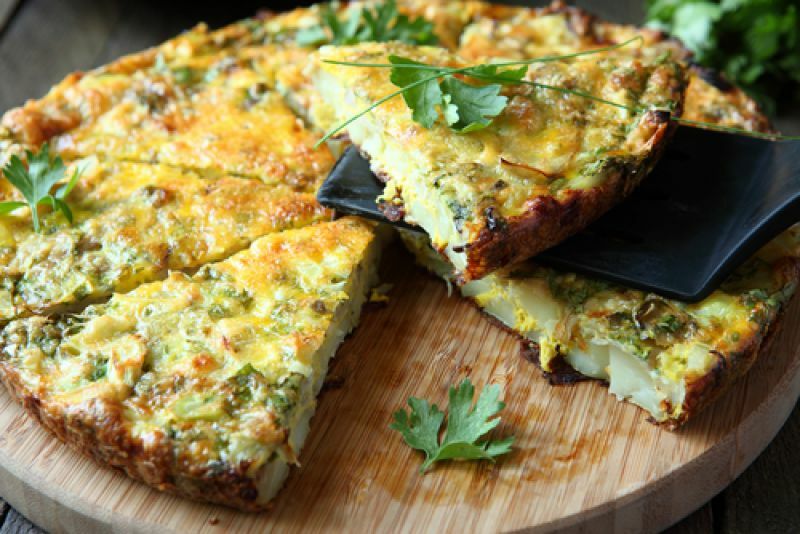 Spanish omelette or tortilla - gently fry a sliced onion and a roughly chopped red pepper in 2 tbsps olive oil until soft, add some sliced, cooked new potatoes and tip everything into a bowl to cool. Add 5 whisked, large free-range eggs, a few chopped chives and some seasoning. Return the mixture to the pan and cook slowly until there’s only a little runny egg on top. Tip the tortilla on to a large plate and slide it back into the pan for a further 5 minutes until cooked through but not rubbery. Cool before packing in a sealed container. Cut into wedges and serve with dressed salad leaves. Softly set free-range boiled hens’ or quails’ eggs - easy to transport and to eat. Plunge them into iced water to arrest cooking and prevent the dreaded green ring round the yolk. Don’t forget to pack salt and pepper or celery salt. A bean salad made with rinsed and drained canned mixed beans, chickpeas and chopped cooked green beans, a small finely chopped red onion, 2 sticks of chopped celery, chopped sweet pepper and some chopped parsley, mixed with a French dressing and chilled in the fridge overnight. Some really good wholemeal or sourdough bread and a selection of lower fat cheeses such as Camembert, feta or goat’s cheese with some pickles. If you’re at the beach and plan to swim in the sea, take a flask of hot vegetable soup that you can drink in a cup to warm you up afterwards. A lighter version of Eton Mess made with 500g of fresh chopped strawberries and raspberries mixed with 450g fat-free Greek yoghurt and 4 roughly crushed meringue nests. Grapes, peaches, nectarines or other lovely, fresh summer fruits. Plenty of water or diluted fresh fruit juice to quench your thirst. Don’t forget to take plates, cutlery, unbreakable glasses, kitchen roll and a damp flannel in a polythene bag to wipe sticky fingers. Pack everything up when you leave and take your rubbish home, along with lots of happy memories.